After 14 years Todd and Chuck Ihde will be passing the Upper Iowa Speedway legacy on to its new owner, Wayne Smith of Cresco. “We can’t thank the local business in Northeast Iowa and Southeast Minnesota enough for the time, effort, and sponsorships they contributed to Upper Iowa Speedway over the years. “ added Chuck. “We had some of the best drivers in the region and the country competing here on weekly basis. They put on some really, really great shows for the fans and other spectators to enjoy,” the pair said. Smith, a current resident of Cresco and business owner of the successful South Side Bar & Grill, looks to continue to build on the Upper Iowa Speedway tradition in 2019. But his main goal is a smooth and successful transition and racing season. “I would like to see a successful season with great weather, but also I don’t see any drastic changes forthcoming. I would like to learn and see how everything works before implementing new ideas,” said Smith. As for the gritty details of the transition, Ihdes will continue to help with the track prep to ensure an outstanding racing surface for the drivers during the 2019 campaign. Also, continuing in 2019, the Upper Iowa Speedway will be a USRA (United States Racing Association) sanctioned race track with five weekly classes: USRA Stock Cars, USRA B-Mods, USRA Hobby Stocks, Mod-Lites and Hornets. “We live in a great region for dirt track racing and there is always a great amount of support. I’m looking forward to next year,” added Smith. Schedule and dates for the 2019 racing season at the Upper Iowa Speedway will be announced at a later date. 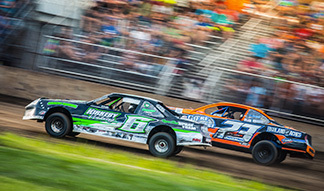 The ¼ mile, semi-banked dirt oval is located at the Winneshiek County Fair Grounds in Decorah.